data and reports describing water condition near you! how water and fisheries biologists determine aquatic health. how data are used in assessments, planning and management. 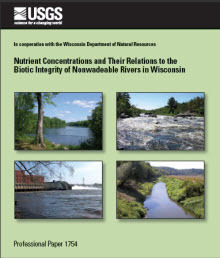 Read the latest update to Wisconsin's Water Resources Monitoring Strategy PDF which sets the direction for resource allocation for monitoring for the next 5 to 10 years. Read the USGS document on nutrient concentrations and the health of biological communities in nonwadeable streams. DNR videos at DNR YouTube channel.